Some marine mammals—seals, sea lions, and sea otters—leave the sea to come ashore from time to time. The reasons behind this behavior, known as hauling out, vary among species. For sea otters, hauling out on land is a way to rest in safety from marine predators, warm up faster, and stay warm longer. For females, hauling out may be an important way to conserve energy depleted while rearing a pup. Healthy sea otters will haul out where they feel safe—often at night, or in places hidden from humans. 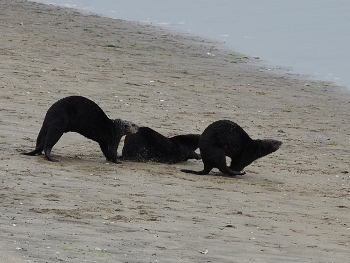 Otters that are aged, sick, or injured also come ashore to rest and recover, and they may pick locations where they are exposed and vulnerable to the approach of humans. 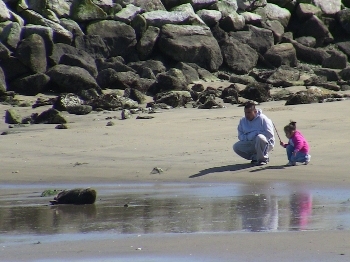 When hauled out on beaches or rocks, both healthy sea otters and those that are sick or injured should be left alone. If you approach a sea otter on the shore, he or she will likely be frightened and flee to the water, wasting energy and body heat critical to health and recovery. If you see a sea otter hauled out, keep your distance (100 feet or the length of two typical school buses) is best. Remember, if the otter looks at you, you are already too close! Leash pets and do not allow them to approach. Sea otters can be aggressive and carry diseases that can be transferred to your pet. Remind others to keep their distance and their pets restrained. If you are concerned that the sea otter is injured or sick call The Marine Mammal Center at (415) 219-SEAL and let the professionals help.